No Spoilers will be written in this review – it will be somewhat short because I think you should read this book! Vanessa, Nellie, Richard, Emma, and Maureen make up the bulk of the characters in this story. They all fit together, but the best part of this story is that it's left to the reader to try and figure out how they all fit. These two authors have done an amazing job at spinning a tale of heartache, love, betrayal, misjudging, and acceptance. You'll think one thing is happening and then all of a sudden, they drop a new piece of information into your lap that fits and it completely changes how you think each character in the story fits. There are twists and turns in this story that you never see coming and when they slap you in the face, you're left going back and re-reading just to make sure that you fully understand the slap. I can't say enough good things about this thriller, but I do hope these two authors write another! I’m still not sure what to make of this slightly twisted psychological thriller. The characters are fascinating – though I’m not sure any of them are terribly likeable. Every time I felt like I was getting to understand Nellie or Vanessa, something in the story would shift and I’d find myself scrambling to readjust. This is a cleverly constructed story, a psychological puzzle. Readers are introduced to Richard through the perspectives of the women in his life and we are expected to untangle the messy relationships through a series of disconnected moments and memories. I found myself thoroughly engaged with the puzzle even as I began to strongly dislike the characters. For me, this was a disturbing read and by the end I really wanted to get all of the toxic, dysfunctional people out of my head. I think readers probably need to be in the right headspace to enjoy this and I’m not sure I was quite there. Readers who enjoy clever, complex psychological dramas will probably love this story. It was just a little bit too dark and disturbing for me. 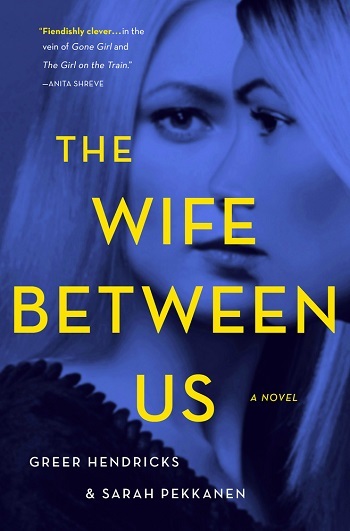 Reviewers on the Wicked Reads Review Team were provided a free copy of The Wife Between Us by Greer Hendricks & Sarah Pekkanen to read and review.